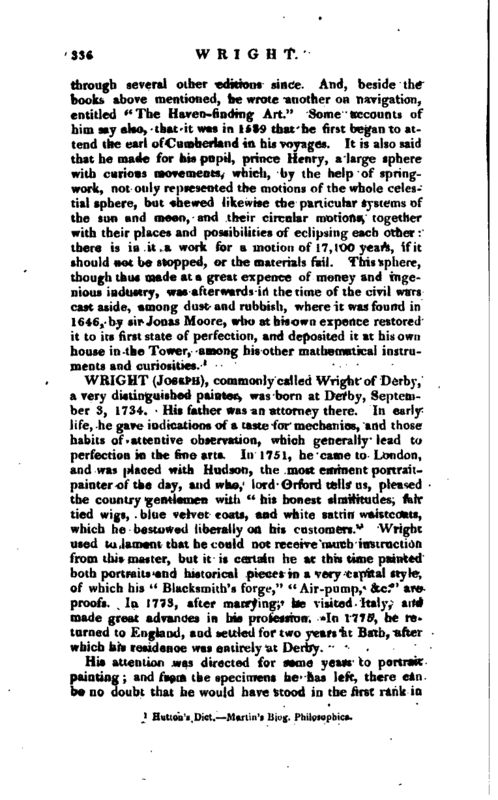 , commonly called Wright of Derby, a very distinguished painter, was born at Derby, September 3, 1734. His father was an attorney there. In early life, he gave indications of a taste for mechanics, and those habits of attentive observation, which generally lead to perfection in the fine arts. In 1751, he came to London, and was placed with Hudson, the most eminent portraitpainter of the day, and who, lord Orford tells us, pleased the country gentlemen with “his honest similitudes, fair tied wigs, blue velvet coats, and white sat tin waistcoats, which he bestowed liberally on his customers.” Wright used to lament that he could not receive much instruction from this master, but it is certain he at this time painted both portraits and historical pieces in a very capital style, of which his “Blacksmith’s forge,” “Air-pump, &c.” are proofs. In 1773, after marrying, he visited Italy, and made great advances in his profession. 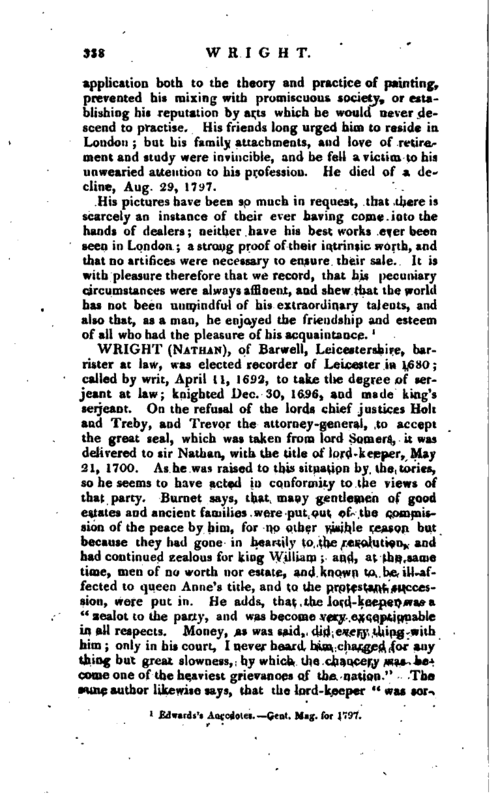 In 1775, he returned to England, and settled for two years at Bath, after which his residence was entirely at Derby. His attention was directed for some years to portrait painting; and from the specimens he has left, there can be no dbubt that he would have stood in the first rank in | this branch of the art, had he chosen to pursue it; but his genius was not to be circumscribed within such narrow limits, and therefore, at a mature age, he visited Italy* to study the precious remains of art which that country possessed. His fine drawings, after Michael Angelo (which have scarcely been seen except by his particular friends), and the enthusiasm with which he always spoke of the sublime original, evinced the estimation in which he held them; and from their extreme accuracy, they may be considered as faithful delineations of the treasures of the Capella Sestina. 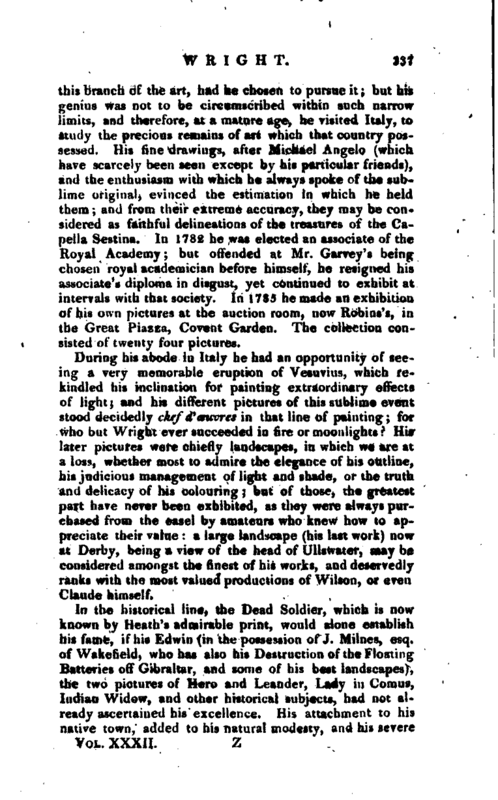 In 1782 he was elected an associate of the Royal Academy; but offended at Mr. Garvey’s being chosen royal academician before himself, he resigned his associate’s diploma in disgust, yet continued to exhibit at intervals with that society. In 1785 he made an exhibition of his own pictures at the auction room, now Robins’s, in the Great Piazza, Covent Garden. The collection consisted of twenty four pictures. During his abode in Italy he had an opportunity of seeing a very memorable eruption of Vesuvius, which fe^­kindled his inclination for painting extraordinary effects of light; and his different pictures of this sublime event stood decidedly chef d* ceuvres in that line of painting; for who but Wright ever succeeded in fire or moonlights? His later pictures were chiefly landscapes, in which we are at a loss, whether most to admire the elegance of his outline, his judicious management of light and shade, or the truth and delicacy of his colouring; but of those, the greatest part have never been exhibited, as they were always purchased from the easel by amateurs who knew how to appreciate their value: a large landscape (his last work) now at Derby, being a view of the head of Ullswater, may be considered amongst the finest of his works, and deservedly ranks with the most valued productions of Wilson, or even Claude himself.